In Marseille, a sailor falls in love with a mysterious, beautiful cabaret girl, who promptly disappears. 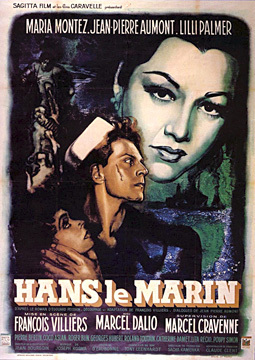 He abandons his ship in order to find her, but becomes sucked into the world of the demimonde on the waterfront. He's soon involved in an altercation where a local criminal is killed; he meets a gypsy who hides him so that he might escape. But will he abandon his search for the cabaret girl? (1949) 95min. Directed by François Villiers. Scenario by François Villiers, Marcel Cravanne and Michel Arnaud; dialogue by Jean-Pierre Aumont from the novel by Edouard Peisson. Photographed by Jean Bourgoin and Raymond Voinquel. Edited by Henri Taverna. Music by Joseph Kosma. 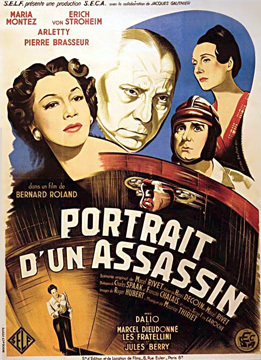 With Jean-Pierre Aumont, Lilli Palmer, Maria Montez, Marcel Dalio, Pierre Bertin, Roger Blin, Grégoire Aslan, Frédéric O' Brady. (1949) 97min Directed by Bernard-Roland. Screenplay by Marcel Rivet & Henri Decoin. Dialogue by François Chalais & Charles Spaak. Photographed by Roger Hubert. Edited by Germain Artus. Music by Maurice Thiriet. With Pierre Brasseur, Arletty, Maria Montez, Erich von Stroheim, Marcel Dalio, Jules Berry, Marcel Dieudonné, Les Fratinelli, Jean-Pierre Mocky.